Caffé Nero and Starbucks are two large tax-dodging coffee chains serving undrinkable coffee. Caffè Nero dodge tax as does Starbucks. Caffè Nero dodge tax through a complex network of companies, ultimately owned by a Vulture Capitalist holding company based in Luxembourg. Debt was used to acquire the company, which is then loaded onto the company, unable to service the debt let alone pay it off, Caffè Nero is a zombie company. Were Caffè Nero to file for bankrutcy, it would be another BHS. This tax-dodging we all pay for with fewer police on our streets, the terrible scenes we have seen over the winter in our A&E departments in hospitals, cuts to social services, mass library closures, cuts to social benefits. For the independent coffee shop, it is unfair competition, as they pay their taxes. Big corporations dominate too many areas of our lives. They destroy the character of our town centres losing our sense of place. When they go under, we are left with devastated town centres which never recover. They drain money out of our local economies. Spend a tenner in a corporate chain and that is a tenner drained straight out of the local economy, less a tiny trickle down to low paid temporary zero hours staff. Spend a tenner in a local indie business and that tenner is retained and recycled within the local economy. There is also a local multiplier. For every pound you spend it is as though more than a pound has been spent, as the local business will spend it in the local economy. The coffee shop will be ordering cakes from a local bakery. And the clincher, the local indie coffee shop serves better coffee. Acquisition of Harris + Hoole by Caffè Nero has resulted in low staffing levels, leading to poor service, many good staff have left, the coffee once sourced from Union Hand-Roasted is now roasted by Caffè Nero, death by a thousand cuts. One reason for the acquisition of this loss making chain may have been to offset tax. I suggest for next issue of Caffeine that UK Uncut are invited to contribute a feature on tax dodging by Starbucks and Caffè Nero. Today we had infantile comments from Dodgy Dave Cameron relating to Jeremy Corbyn being fined £100 for late tax returns. 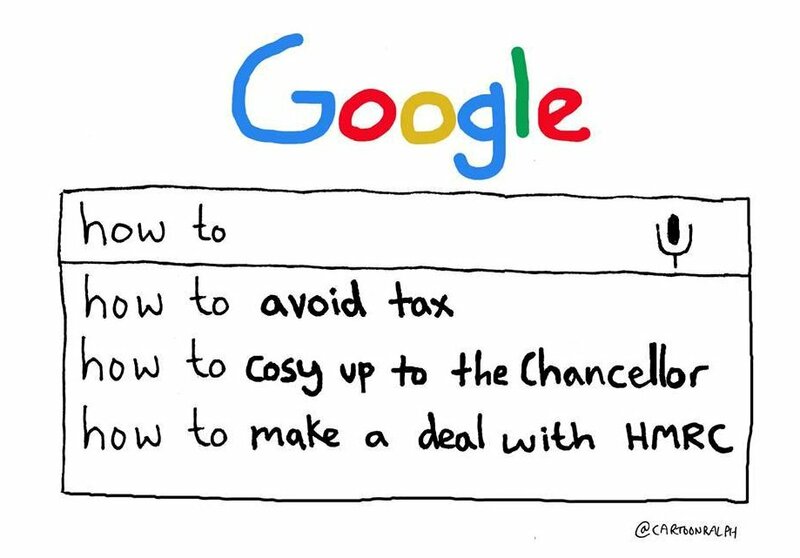 Were Google fined for being six years late in paying their tax? Cameron is totally out of touch with reality. He fails to comprehend the anger of ordinary people and small businesses, who work hard and pay their taxes. Following the Panama Papers scandal and Cameron’s subsequent bungled reaction, we saw hundreds protest outside Downing Street calling for the PM’s resignation. Meanwhile, the right-wing media attempted to bite back: the Metro ran a front-page headline on ‘Corbyn the tax dodger’ (referring to the fact that Corbyn paid a £100 fee for filing his tax return five days late, rather than avoiding any tax at all.) The Telegraph ran a story accusing Corbyn of receiving £3 million from the state, also known as his salary for his 33 years’ work as a Member of Parliament. The Sun even tried to suggest that the Labour leader had purposely failed to reveal earnings from a lecture he once delivered. The truth was a little different – as it turns out, Jeremy Corbyn actually paid more tax than he should have. I mentioned this today to a restaurant owner. He told me of how he was treated when he was late paying his tax. An oversight not an attempt not to pay. A visit by an angry tax man, who wanted to strip the restaurant. He wanted to take the paintings off the wall, which he assumed to be of value. They are, but do not belong to the restaurant, they are on loan. Then he wanted to take the bottles of wine in a rack by the wall. Not wine, bottles of water. For show. No self-respecting restaurant would store wine where it was warm. The tax man was asked, as there was a delay in paying the tax due to an oversight, why did he not send a reminder? The response was he did not have to. The tax man was told go and harass Starbucks. Tax credits do not subsidise workers they subsidise bad employers. If their business model relies on paying poverty wages then they should be driven out of business. We eliminate tax credits, by paying higher wages, by creating high paid, skilled jobs. We eliminate tax credits by, as outlined by former Greek finance minister Yanis Varoufakis, using a People’s Quantitative Easing to create the cool breeze of green technology, by financing apps that create a sharing, collaborative economy, not the failed Quantitative Easing of the Tories, a mechanism to transfer more wealth to the rich, and in doing so, create piles of dead money. The policy of the corrupt elite is to drive down wages to that of China and India. The Tories want to cut tax credits by £4.2 billion. That is £4.2 billion taken out of the pockets of the working poor. It was not the poor who caused the financial crash of 2008, it was the greedy bankers, greedy bankers who finance the Tory Party, but it is the poor, who can least afford it, who are being forced to pay the price. Liar David Cameron said before the last election, they would not cut tax credits. Bully-boy David Cameron is intimidating the House of Lords not to vote against tax credits. Even threatening to swamp the Lords with yet more of his cronies. Apart from waging Class Warfare, why are the Tories so eager to cut tax credits? Simple, more money available, £4.2 billion, to cut taxes for the rich and corporation tax. It is nonsense to suggest a constitutional crisis is pending, for the simple reason we lack a constitution. Equally to claim support of the House of Commons. It is not support when you have to force MPs to vote with you. Neither can it be claimed support in the country. Tories had minority electoral support, and with the election of Jeremy Corbyn as Opposition Leader, what little support there is is draining away by the day. If the only role of the Lords is to rubber-stamp what is sent from the Commons, then what role the Lords? This would be yet further grounds for abolition. The House of Lords must listen to what the people are saying, look at the impact on the lives of the poorest, not jump to diktat from the Tory government. When those demands land on the doorstep, remember who cut your tax credits. Please sign the petition calling upon the House of Lords to veto cuts to tax credits. Shame on Trussell Trust who pay their employees so badly that they have to rely upon tax credits to top up their wages. I mentioned today to a Trussell Trust manager she would be seeing a sharp increase in demand for food banks, as David Cameron had strongly hinted abolition of tax credits. To my surprise, she said she would be affected as she was reliant upon tax credits to top up her wages. Now this is to be expected from KFC, McDonald’s and other bad employers, but should not we expect better standards from Trussell Trust as the country’s biggest providers of food banks? Today David Cameron gave strongest hint yet that he intends to abolish tax credits, part of class warfare on the poor and demonstration of economic illiteracy. David Cameron is correct, yes we should abolish tax credits, and it would go some way to reducing the welfare bill. But the way to cut tax credit is to raise the minimum wage. Tax credit is the taxpayer subsiding bad employers. Raise the minimum wage, pay people a living wage. If the business is dependent upon paying people low wages, worker exploitation, then it is not a viable business. If increasing the minimum wage puts out of business McDonald’s, KFC, Sports Direct and other bad employers, then all well and good. 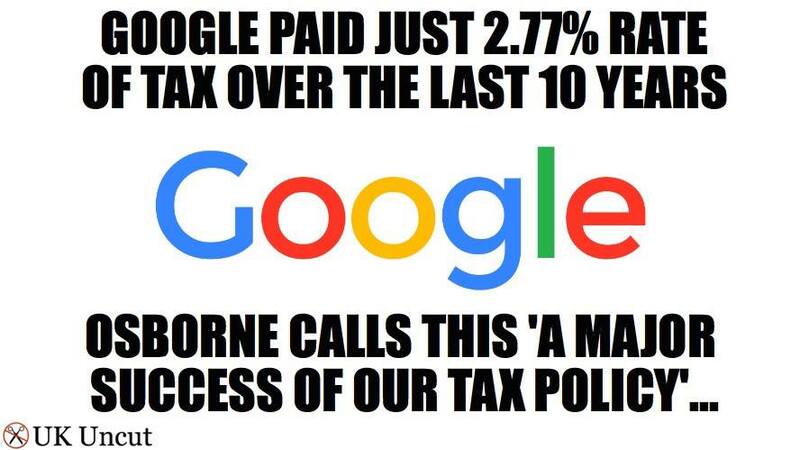 And shame on Trussell Trust who pay their employees so badly that they have to top up their wages with tax credits. I would expect better from a charity that provides food banks. And shame on Labour, the usual hypocrisy. Howls that tax credit may be cut. Why not instead call for an increase in minimum wage to make tax credits redundant? With the exception of Jeremy Corbyn, Labour wannabe leaders were absent from the anti-austerity rally on Saturday. David Cameron says he wants to create a fairer society. He does this by cutting money to the poor and vulnerable. There are 3 key drivers of opportunity – strong families, a first-rate education and a welfare system that encourages work. David Cameron wishes to force people into low paid, mind numbing, temporary, part time, zero hours McJobs by cutting benefits and issuing sanctions that terminate benefits. In other words starve people into work. Or force them into work as unpaid slaves on workfare programmes. Today saw one of the biggest protests in London since the protests against the illegal Iraq war, an estimated a quarter of a million people on the street in London to protest against austerity. Not only London, protests in Bristol, Liverpool and Glasgow. Not only UK, protests across Europe in support of Greece and their fight against IMF-EU-German imposed austerity. Austerity is a lie. It is a totally discredited policy. It has destroyed the economies of Greece and the UK. In both countries used as an excuse for Shock Doctrine, slash and burn of public services, closure of public libraries, cuts to welfare benefits, sell-off of state assets at bargain prices. . In Greece, GDP has shrunk by 25%, debt risen from 125% to 175% of GDP. In UK, five years of austerity has seen real wages stagnate, the poor get poorer, mass transfer of wealth from the poor to the rich. During this period, the rich have doubled their wealth. For once, the BBC actually covered an anti-austerity protest, not only covered but had at the top of the news agenda all day. Speakers included Caroline Lucas, Jeremy Corbyn, Charlotte Church, Russell Brand. Labour still do not seem to understand why they lost the election. They demonstrated today how out of touch they are. Of the leadership contenders, only Jeremy Corbyn showed up. The protest in London was organised by The People’s Assembly. Days before the rally the Daily Mail reported it would be hijacked by anarchists, they filmed a secret meeting, that the day would end in violence. It was a day of peaceful protest, a carnival atmosphere, families turned up. The police reported no arrests. 250,000 people on the street and the police report no arrests. The protests were just the beginning of protests against austerity. Large anti-austerity protests in many European cities today in solidarity to #Greece. 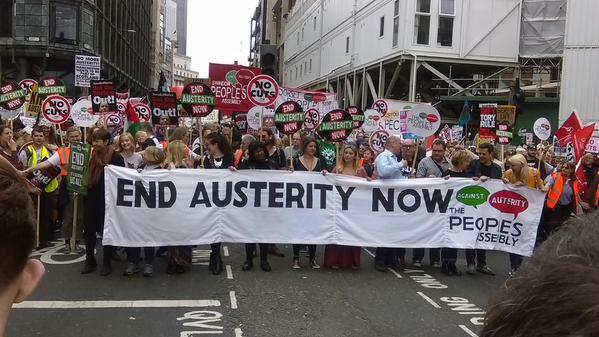 #EndAusterityNow hashtag trending worldwide. This evening George Osborne announced what has been an open secret for some time, that he intends to sell off Royal Bank of Scotland on the cheap. The sale will be at a loss of £10 billion pounds. The advice on the sale price has come from investment bankers. And who will make a killing on the sale? Er, none other than investment bankers. Scroll back a couple of years and we see the RBS sell off is a re-run of the Post Office sell off. The Post Office was sold on the cheap at a massive loss to the taxpayer. And who advised on the sale price? Investment bankers. And who profited from the sell off on the cheap? Er, investment bankers. George Osborne during the Election announced a £12 billion cut to benefits. This on top of the cuts already made. As usual under the Tories, the poor suffer the rich profit. Iceland which refused to bail out the banks, indeed they gaoled the bankers and the people took direct action to force the government out and constitutional changes, had a few tough years, is now the only economy in Europe that is recovering. The UK could have let the banks go bust, but instead bailed out the banks, and used the consequential economic crisis as an excuse for austerity, Shock Doctrine, cuts to public services, library closures, cuts to welfare benefits. Instead of this cosy relationship with the banks (who fund the Tory Party), we should be breaking up the banks, spitting casino banking from retail banking, and throwing a few banksters into prison. So far not a single bankster has had so much as a slap on the wrist, let alone had to serve time in prison. Please sign the petition calling for a halt to the sell off of RBS on the cheap. You are currently browsing the archives for the UK Uncut category.